Every time I need a pick-me up, I run to the kitchen and make pizza. Margherita, usually. Simple, pure and very homey. I am not sure whether it’s the fact that I haven’t found a truly authentic Italian pizzeria in Charlottesville, but I always prefer making my own pizza pie then eating out. 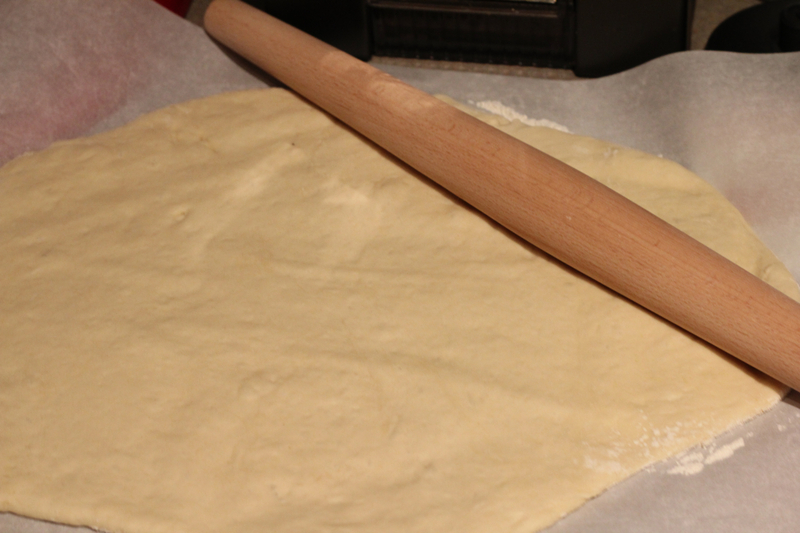 The best part about pizza is the process and every time I work the dough, I remember why I love cooking. Working with ingredients, making something so complex out of something so simple: flour, extra virgin olive oil, yeast, salt and a hint of sugar. My mom taught me how to make pizza. She never stopped at the recipe, however, but inserted little pearls of knowledge I only now really appreciate: how to measure the flour, how to choose the best tomatoes available, why use a pizza stone. In a sense, when I make pizza I try to channel her attention to detail, her diligence with instructions (I tend to overlook steps in recipes…and it never turns out how it’s supposed to turn out), and living 3,000 miles apart, I try to channel her. It’s my way of having her so much closer to me. 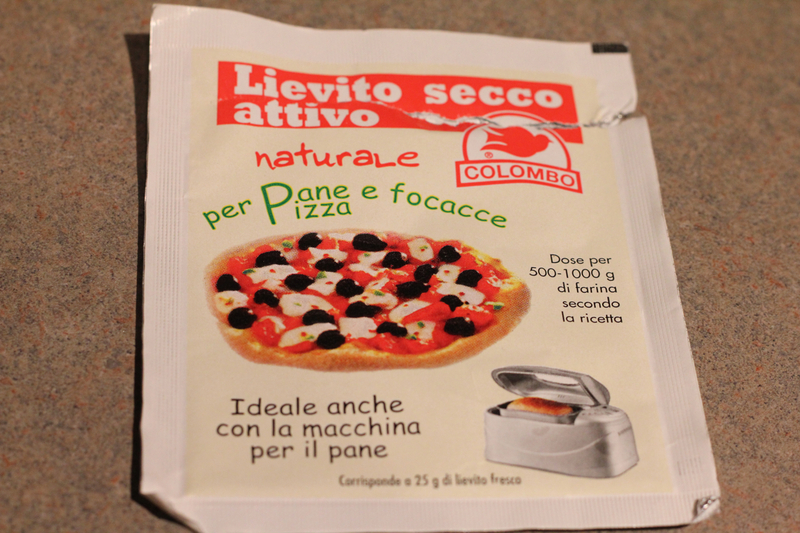 I like trying out different recipes and the one that I currently like comes from the back of the packet of yeast we bought in Italy. The first step is taking care of the yeast. Since it’s dry, cream the yeast with a little bit (half a glass, more or less) of warm water and a hint of sugar and let is sit for about 15 minutes. Because yeast is “alive,” it needs food and its food is sugar. It makes perfect sense thinking about it, right? 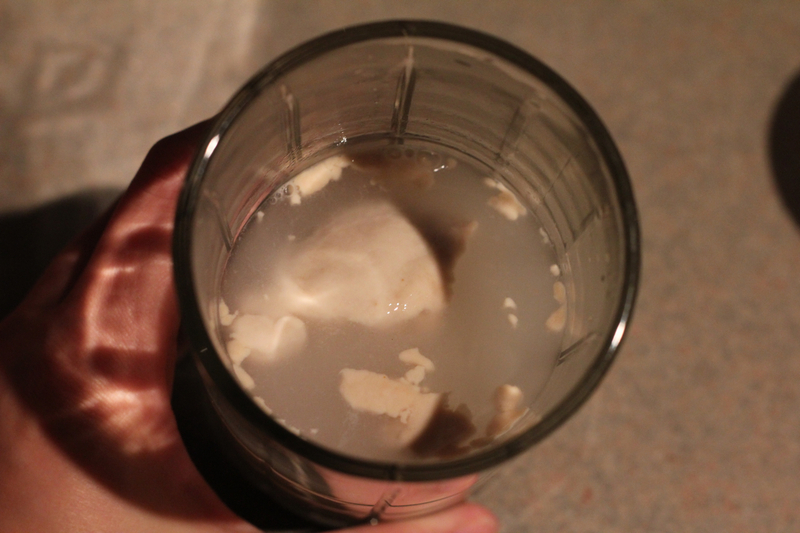 The yeast will plump up and come to the surface, just like in the picture. While the yeast is working, add the flour, olive oil and salt. One third of the total amount of flour needed for the recipe is Manitoba flour, which was sent to us from Italy. 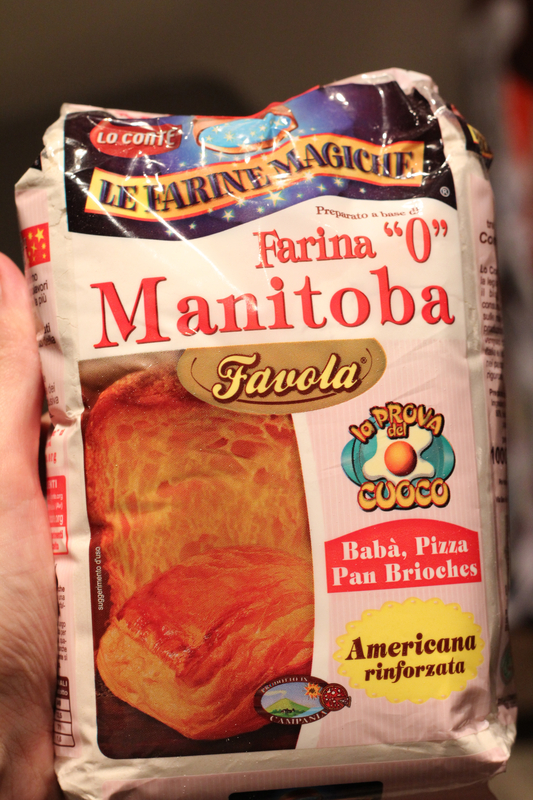 Apparently, and this came as a surprise to me, the Manitoba flour is from North America, hence the Manitoba name (a province in Canada) and it’s starchier than the regular all purpose flour found in the United States. The dough is not too thick and not too sticky, just the right consistency. Flour a cutting board and add work the dough for about 5 minutes until it’s elastic and uniform. Let the dough rest for about an hour in a warm place. (I usually oil a bowl, add the dough, wrap it with a damp cloth and I put in a plastic bag. It does the trick!). In the meantime, cut the mozzarella bites in half and mince the whole, peeled tomatoes. Set both aside. Pre-heat the over at a high temperature, 420F. Once the dough has risen to twice its size, flour the cutting board you used before and work the dough one more time before stretching it. The dough should be soft and not sticky. After five minutes, starting stretching it with your hands and press the edges with your fingers tips. 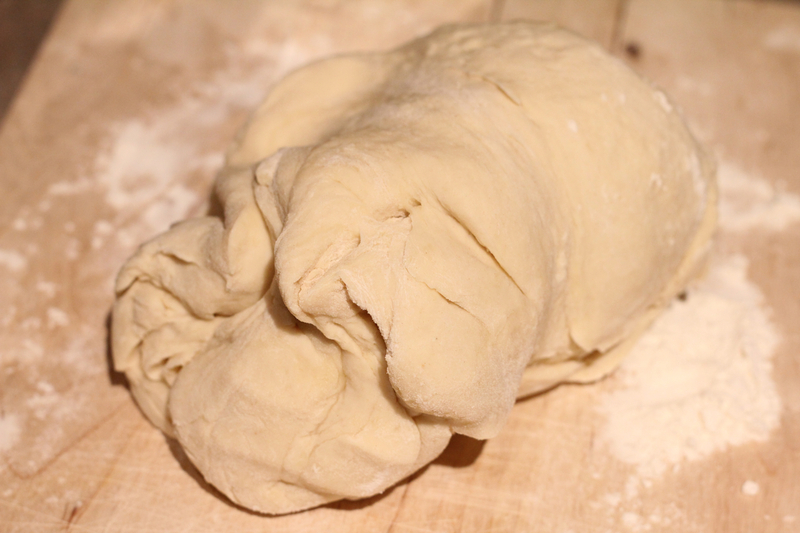 Once the dough is thinner, you can begin shaping to your like. I have a square oven pan and I use my roller to stretch its edges. Sometimes the square shaped dough is better than others, but I don’t complain. It’s delicious anyhow. 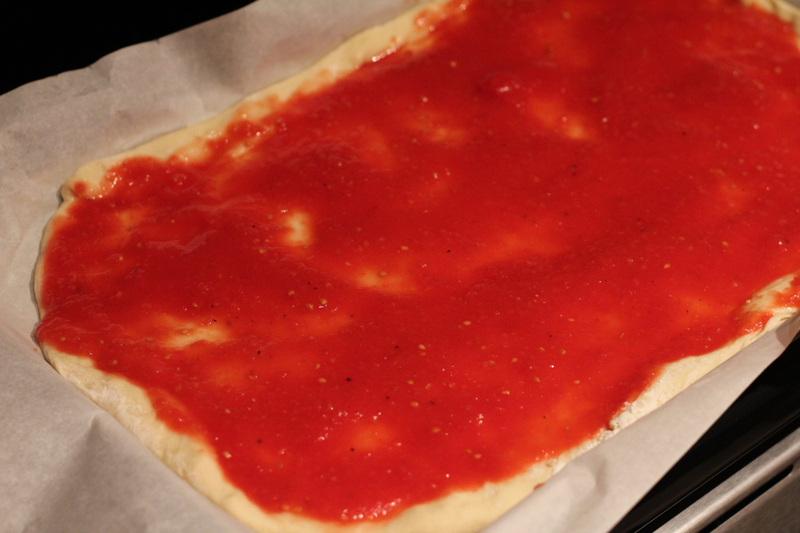 Once the dough is either on a pizza stone (recommended) or in an oven pan, carefully pour the minced tomatoes, with the consistency of a sauce, over the entire length of the stretched dough. Make sure that the sauce is evenly spread. Add the mozzarella bites (my favorite part). 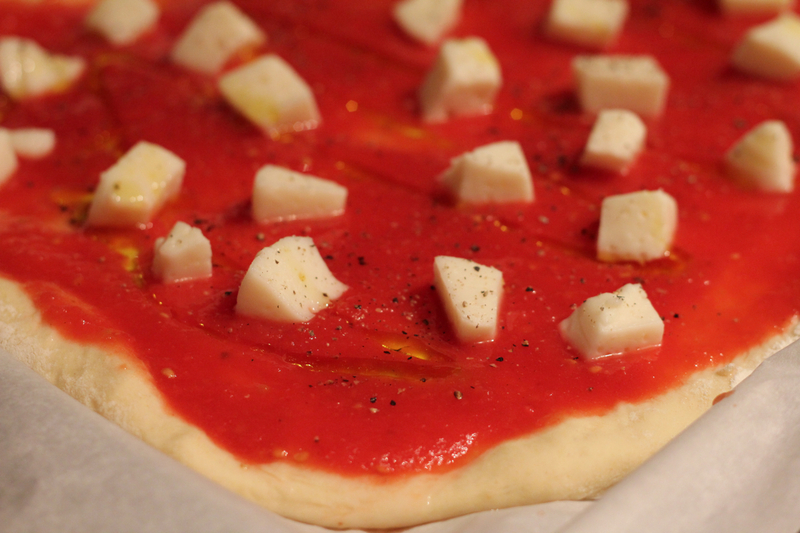 Add a little extra virgin olive oil, salt and pepper and any other garnish you want on your pizza. 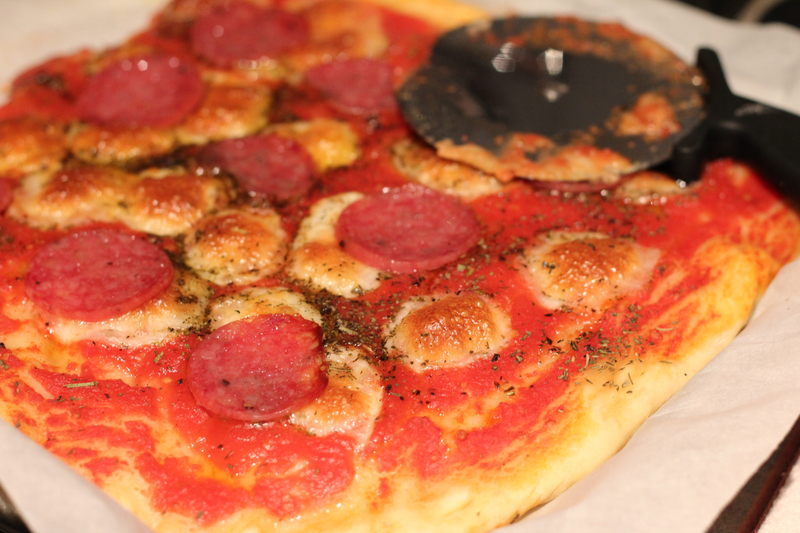 In this case, we used fresh, Italian salami. Bake the pizza in a 420F for about 20 minutes. If you like your dough a bit crunchy, I like to turn off the over after 20 minutes, but leave the pizza inside to bake a little bit more. 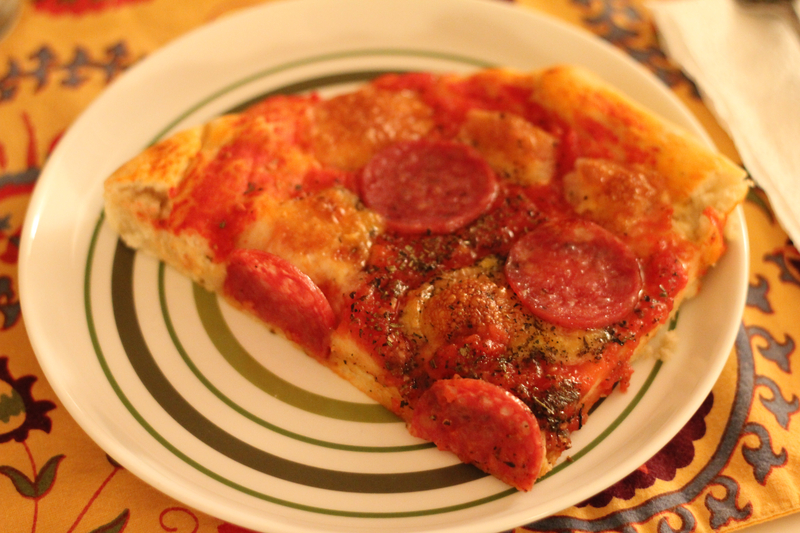 Once the pizza is ready to be served, I sprinkled a little bit of dry oregano. It’s that simple. Eat it by yourself or with company, pizza never disappoint. 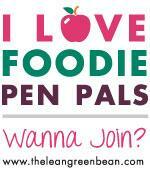 It makes for a great lunch the next day! Buon Appetito!